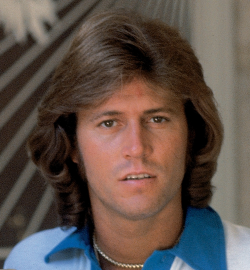 This week I’m posting a story from a fan whose Bee Gee memories go back to “Barry in chambray in 1975”. Ah, yes! Now, that’s a priceless snapshot to have in my mind’s eye. I can’ t remember the first time I heard the Bee Gees, but I remember the first time I saw them live. It was in July of 1975 in New York in what was called the Schaefer Music Festival. It was first come-first serve seating, and I was first in line in the pouring rain hours before the concert. I have always hated the rain, and for me to stand in it was monumental and stemming from my pure love for them and need to hear them live at any cost, even being soaking wet. They came onto the stage, and my love, Barry, was wearing a chambray denim work shirt, the style of that era, and he was stunning. I melted. I was sitting in the front row center. I remember standing on my chair and taking my binoculars and zooming in on Barry. I wasn’t close enough in the front seat! I remember Barry spotting me and looking right into those binoculars! I still have photos of that concert. They aren’t great but the memories are vivid. I’ve seen the Bee Gees so many times since that I’ve lost count. I saw them at their Madison Square Garden series in 1979 and went every night they played, and each night my seats got better (thanks to a boyfriend at the time who indulged me), until the last night when we were front and center. I was there the night Andy played with them. Fast forward to Jones Beach New York, 2014, another outside venue, and I still hate the rain. It was pouring all day, but I was going to see Barry. The rain stopped for part of the evening; and even though it was cold and very damp, the man and his music warmed my heart. I melted just as I had in 1975. His emotions moved me to tears, and I am teary as I type this. What a beautiful story. Just like the Bee Gees…….beautiful. Wow, that must have been great to see Robin….very nice memory. Thanks for sharing that one..
Great article. Wow for this photo!!! Thanks for the comment, Kathie. Yes, he looks good at any age..